Russia and Saudi Arabia play each other to open the World Cup on June 14. Soccer may not explain the world as well as Foer traces in his famous 2004 book (How Soccer Explains the World), but it may set the stage for the oil producers' meeting next week. Neither country's football team are regarded highly, and Russia is the odds-on favorite for the opening game. 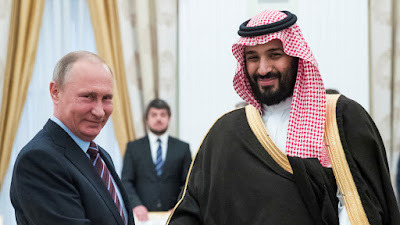 However, both Russian President Putin and Saudi Prince Mohammad bin Salman (MBS) will be attending. If politics makes strange bedfellows, oil interests appear more paramount. Russia has allied itself with Saudi Arabia's chief rival Iran, with whom it is engaged in proxy wars. Iran, Iraq, and Venezuela are reluctant to agree to boost output. In part, because they can't. Iraq simply does not the have the capacity. Venezuelan output is falling due to the economic and political crisis. Iran is exempt from OPEC quotas, and it is trying to ramp up oil output. When it comes to oil, Russia, and Saudi Arabia have mutual interest. Saudi Arabia and Russia are already boosting output. They are not waiting for next week's meeting. Saudi Arabia indicated it boosted output above 10 mln barrels for the first time since last October. Under the output restraint agreement, the Saudi's agreed to cap their output at 10.058 mln barrels a day (bpd). It cut even more. Moreover, Saudi Arabia is one of the few countries that burn oil for electricity and typically boost output in the summer months for domestic consumption. Reports indicate that Russian output hit a 14-month high of 11.09 mln bpd in the first week of June, which is just beyond its agreement to cap output at 10.95 mln bpd. Several companies are believed to have boosted output above their caps. Why are they boosting output? Some in the media have played up US pressure. Reportedly, the US "pressure" came so that its sanctions against Iran would not be disruptive. Others have noted China pressure as well. However, self-interest speaks loudest. Many of the goals of the cuts in output have been achieved, though it took longer and deeper cuts than initially anticipated. Oil inventories have returned to their five-year average. Today OPEC said that the preliminary data for April showed OECD oil inventories were 26 mln barrels below its target of the five-year average. Even if that average has been inflated by the rise of inventories of the last couple year, globally, stocks are still falling. The price of oil has increased dramatically. Brent bottomed in January 2016 near $27 a barrel. It briefly traded above $80 last month (continuation futures contract). This was a price target that some officials had suggested was desirable. It is thought that higher prices will encourage marginal producers and alternatives. That needs to be balanced with the financial requirements of the government. Oil-related revenues are the main source of revenue for many oil producers. Traditionally, break-even was thought to be the cost of finding and drilling a barrel of oil. The meaning morphed in 2014 and 2015 to the price of oil needed to balance government budgets. Part of the issue is that the decline of OPEC output is not simply because of purposeful cuts. Venezuela and Libya's output have been cut due to political problems. New leaks have been discovered in a Nigerian pipeline that also takes production off-line. In other countries, the drop in oil prices cut exploration and development and the under-investment not only reduces output, but it leaves them unable to boost output to capture the higher prices. Saudi Arabia and Russia are boosting output, not because their customers want lower prices, but rather to make up for the reduction by other producers. Last month Russia and Saudi Arabia proposed boosting output, as they were doing so, without first consulting with OPEC members. Iraq, for example, the second largest OPEC producer, is opposed increasing output. Iraq would find it difficult to boost its own oil output due to technical factors and its political clash with its Kurdish population. OPEC's decisions are supposed to be by consensus, but Saudi Arabia and its allies are likely to push forward in any event. The extent that Russia can boost output. Gazprom says it could be as much as 500k bpd. Other estimates. It cut output by about 300k bpd from the 11.25 mln bpd in October 2016. Between Russia and Saudi Arabia, output appears to have risen by around 300k bpd. This is about a 1/6 of what agreed to have cut, and Saudi cuts were somewhat deeper than their commitment. One important variable is how much Iranian oil will US sanctions take out of the market. When the US imposed sanctions on Iran, then President Obama managed to get allies to support its efforts, without which the sanctions would have been as tight as a submarine with a screen door. European buyers of Iranian oil participated, as did Japan and South Korea. Other US allies also cooperated. Even China, which is Iran's largest customer then and now, purchased less, despite their rhetoric. Now the goodwill is all but gone, and it w.ill be difficult to make the sanctions as punishing as they were previously. The Trunpp Administration is trying some of the same tactics as the Obama Administration, seeking voluntary cooperation to eliminate or at least reduce purchases of Iranian oil. Some observers have argued that an oil futures contract in yuan may help China dethrone the dollar as the key reserve currency. This seems far-fetched in any meaningful timeframe, but what it can do is provide another way for Iran to bypass the dollar and the sanctions. Like the Obama Administration, companies have been given up to six months to make the reductions voluntarily, but the stick awaits if the carrot does not succeed. Iran says that it will stick with the nuclear ban agreement provided Europe does not cut back on its oil purchases. If Iran were to break from the agreement, other countries, including those in Europe, might look more favorably at US sanctions. Some European companies that buy Iranian oil (and do business in the US) have indicated a willingness to participate. There is likely to be reluctant support by other companies and countries, but nothing on the magnitude that was seen previously. China and India account for about 60% of Iranian oil sales. The next two largest buyers are South Korea and Japan, which together absorb about 30% of Iran's oil exports. India balked in the earlier sanctions, but eventually reduced their purchases by 20% to avoid US punishment. Between May 22 and June 3, WTI for July delivery fell by about $8.7 a barrel to almost $64 from the peak a little below $73. It retraced half of the gains from the year's low set on February 9 of almost $57. Prices are trying to recover and today's is the sixth consecutive session of higher highs. Initial resistance is seen near $67. The technical indicators are constructive. Perhaps they are signaling that the coming boost in output is more modest than the one million barrels some are suggesting. We had been thinking more like 500k barrels, of which 300k is more of less already being done. So watch the World Cup match. Root for whichever team you want. The Saudi-Russian oil axis of convenience is carrying their own water when it comes to boosting output. The risk is that output is boosted by more than necessary to offset the output slippage by some members and the US sanctions on Iran, which are unlikely to be felt much before mid-Q4.